In 1986, Cynthia Knauf went into the woods. Like many people in their late twenties and early thirties, Knauf was trying to find herself. She was desperate to figure out what moved her. She thought a tour of duty with the Appalachian Mountain Club in New Hampshire’s White Mountains might shake loose a few ideas. What she discovered during her wilderness sojourn was that working in publishing, which she had been doing for years, wasn’t fulfilling. Nature was what really called to her. It was in the woods where Knauf came to understand just what space is. “I react so much to the space I’m in, and I realized our spaces are so important,” she says. It was also there, amid the soaring conifers and craggy rocks of the Whites, that Knauf figured out how to meld her love of nature with her understanding and appreciation of space and how it is used. 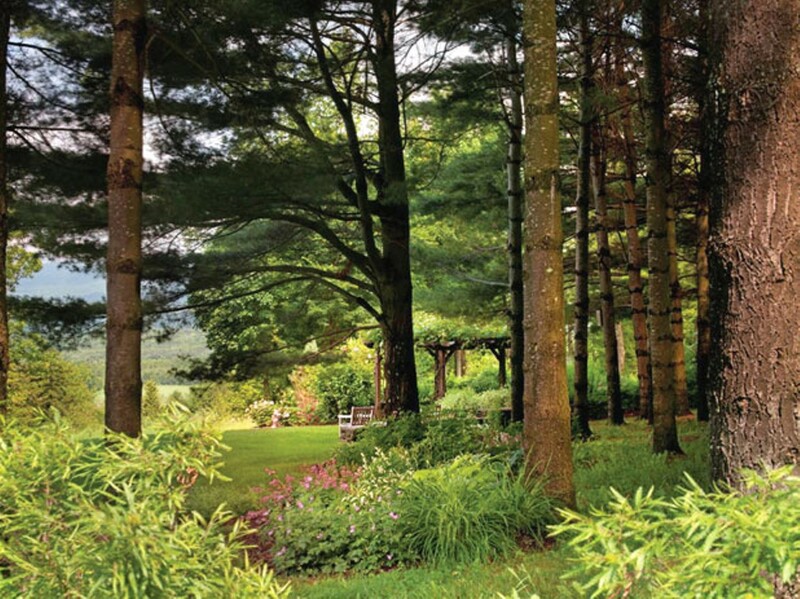 A year after her two-year tenure in the woods ended, Knauf graduated from the Conway School of Landscape Design and moved to Vermont to begin her second career as a landscape designer. 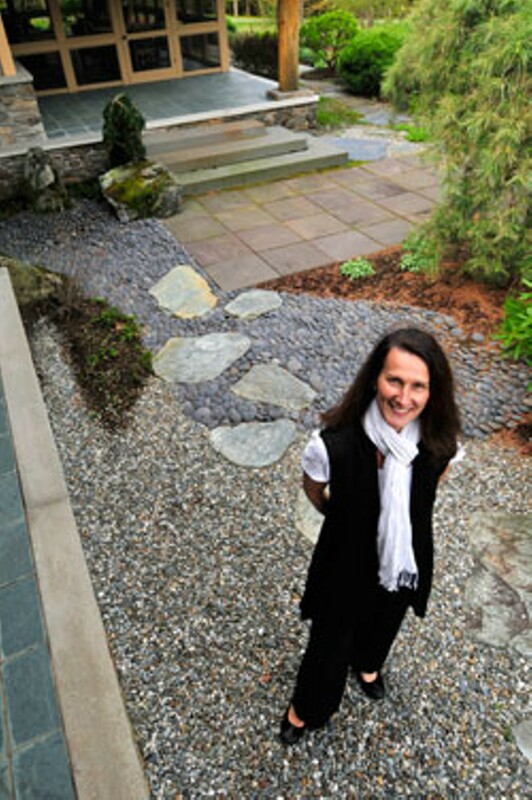 Today, 52-year-old Knauf is one of the leading landscape designers in the area. Her clients, which range from progressive prep schools to leading green businesses to environmentally minded homeowners, seek her out for her seamless design that brings the indoors outside in sustainable ways. If being in the woods for a year taught her anything, she says, it is that we are all stewards of the natural world. That concept has informed and inspired her design ever since. Knauf’s work is rare in being luxurious without being ostentatious and in putting principles of sustainability above all else. She creates rooms that have no walls and vistas that extend for miles. Her work conveys a feeling of sumptuousness while staying firmly grounded in the natural world. Knauf, a soft-spoken woman with sharp features and shoulder-length brown hair, works primarily with native plants and never with invasive species. She employs rain gardens and edible forests when she can and always seeks to recreate wildlife habitats with flora that attracts birds and other creatures. Site-harvested boulders and ornamental rock gardens in her designs encourage moss growth and help guide and filter water. When describing her design aesthetic, she sums up her work in a word: integration. “I strive for integrated composition,” Knauf says. “The design has to flow from inside and work its way out.” While Knauf is equally versed in a range of landscaping styles, from contemporary to naturalistic to Japanese, the common thread in her work is this meshing of indoor and outdoor spaces. That sense of flow from indoors to outdoors is what Maureen Labenski loves about the landscape Knauf designed for her Elmore home. A sense of simplicity pervades Labenski’s 3000-square-foot Japanese-inspired house, so Knauf worked to extend that to the exterior property. The shrubs, trees and flowering plants that surround the house are unobtrusive and give the feeling that they have been there forever, something Labenski values about the space. Knauf’s designs for the Labenski home also respect seasonality. “It’s a very organic blend of texture and color that really covers the season,” Labenski says. “Whatever the season, there’s something going on.” Labenski’s magnolias just finished their bloom, and the shadblow trees are currently flowering. Soon the crab apples will begin to open up. Knauf’s design highlights each season, but she also understands that landscapes should give people something at every time of year. Labenski’s weeping pine and tamarack are testaments to that. “They’re interesting all year round,” she says. What the Carpenters got was a low-maintenance yard that has a sense of place. The outdoor space is segmented into “rooms” with cut flowers in one area and edible plants in another. The vegetation leads visitors from imagined room to room, Carpenter says. 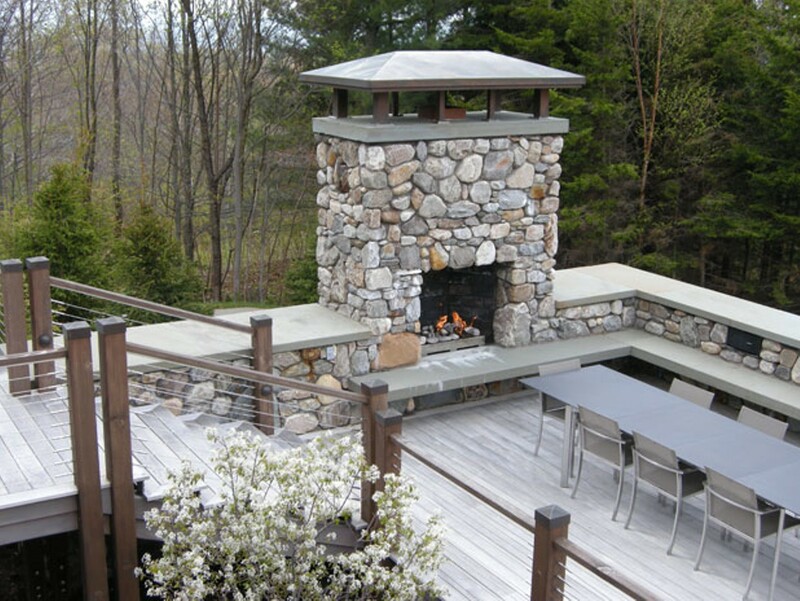 Knauf also designed a fire pit and an outdoor spa for the property, both made of natural materials that make them feel as if they belong there. Given Knauf’s sense of place and seasonality and respect for the existing environment, it’s not surprising that she would want to move her creations toward sustainability. To that end, Knauf has partnered with architects and civil engineers who are at the forefront of green design. While half of her work is landscape renovation, the other half involves new construction where a team of collaborators realize a vision for a space together. One of the architects with whom Knauf works closely is Bill Maclay of Maclay Architects in Waitsfield. He describes Knauf and himself as “people who are connected to nature” and try to incorporate that in their work. The pair recently collaborated on a net-zero residence in Moretown, dubbed the River House. The River House, which sits on a stone dam abutment above the Mad River, features a super-insulated envelope, on-site photovoltaics, and a ground-source heat pump and domestic hot water system. The home also boasts a green roof, rain gardens, terraces and a Japanese garden with outdoor shower, designed by Knauf. The goal in building the house, Maclay says, was to make it “totally connected to the river” — something they achieved by working with, not against, the topography. The house’s green roof is planted with sedum — a cold-hardy plant that thrives in shallow beds and whose leaves store water. They require little maintenance, needing to be weeded only while the plants are filling out. Knauf used a variety of sedums to create a textured composition that will absorb rainwater and provide insulation to the home. With like-minded architects like Maclay, Knauf is able to blend her aesthetic with what she calls “true sustainability.” This means designing a lush landscape that honors regionality and is a part of the ecosystem. But, she says, you can do formal gardens sustainably. As the green movement becomes ever more mainstream, Knauf hopes clients will follow suit. Slowly, she says, they are seeing the value of rain gardens, green roofs, edible forests and native plants set amid their ambrosial gardens.